This was published today on the Blog-Off on Searching Bones. And remember to support the Actor's Fund! While the rapport between Brennan and Booth are the main focus of "Bones," I came to an amazing realization a while back on why I actually prefer the squints. And it all came down to "Ghostbusters." "Ghostbusters" and "Ghostbusters 2" have been my favorite movies, hands down, since I was about nine years old. That was when "Ghostbusters 2" was released, and it was one of the first movies I remember seeing in the theater and not being too young to appreciate. While most of the jokes went over my head, I developed an instant crush on one 'buster: Egon Spengler (Harold Ramis). Go ahead. Laugh. 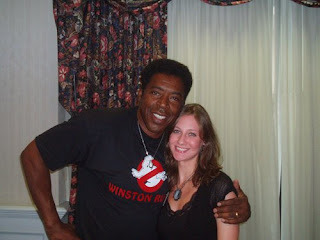 But I have always loved Egon. The glasses. The high hair. And the intellect. Rowr. Fast forward to 2008 - holy crow, almost 20 years later???? - and I am infatuated with "Bones." I can't put my finger on precisely why. Temperence Brennan was a superbly written female lead. The Bones and Booth relationship was that of a screwball comedy. But something about Zack Addy and Jack Hodgins got me just a bit more than the hunky, snarky Booth. 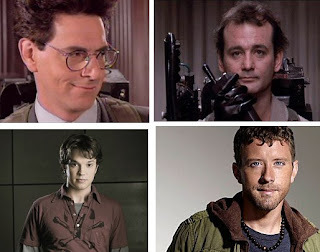 I realized soon enough that it was because I was watching the respective reincarnations of Egon Spengler and Peter Venkman. Surely you see it, too: Egon and Zack are the logical, rational types with the million-dollar vernaculars and the infinite intellect. Venkman and Hodgins are also both supremely intelligent, with double doctorates, but unlike Egon and Zack know exactly how to use their brains to win over ladies. Egon was probably just like Zack in his younger days, socially awkward, but with a bunch of secret admirers who tried to send signals and failed to get past the Wall of Smart. Venkman and Hodgins, on the other hand, knew how to budget their smarts and instead used their positions and intelligence for what Egon and Zack would consider unproductive purposes. EGON: I'm terrified beyond the capacity for rational thought. VENKMAN: Nimble little minx, isn't she? VENKMAN: Why worry? Each of us is wearing an unlicensed nuclear accelerator on his back. VENKMAN: ...This reminds me of the time you tried to drill a hole through your head. Remember that? Yup. Doesn't get much better than that. If "Bones" can get Aykroyd on the show somehow, I will be in nerd heaven. I wouldn't have understood without it! That's awesome! I have seen both Ghostbuster movies more times than I can remember. There are some striking similarities between the 'Busters and the Squints, which I had never thought about before. Well done! Please read my previous post first and die happy.